We get extremely excited every time we stumble upon a new hole in the wall restaurant to share with Jacksonville. Droubi’s on King Street fits the bill across the board. Tiny, barely noticeable door? Check. Limited seating? Check. Secret food menu full of delicious treats? Check. Droubi’s piqued our interest quickly, so we headed out to see what Droubi’s had to offer. I went in with the goal to try out as much as I could across the menu so I went with four other friends. As soon as we walked into Droubi’s we could see a challenge in having a large party. There were three two-person tables scattered against the outside walls and a bar that seats only four. However, the two owners immediately offered to combine tables for us to give us space for our group. The anticipated customer service need without us having to ask was a nice reception. The menu across the back of the restaurant contained smoothies only, this is one of the tricks about Droubi’s. There is a small, front and back laminated menu behind the counter to pass around if more than their smoothies are desired. Be advised – the menu found online that includes pizzas is not correct, that was their original menu and the pizzas have since been removed. One friend and I decided to split a smoothie and spinach pie as appetizers and we listed off our food allergies to the owner, who recommended a smoothie to us that suited what we needed. The Droubi smoothie ($5.99 for a 20 ounce) was spinach based and blended with fruit and mint (described as the owner’s secret recipe). 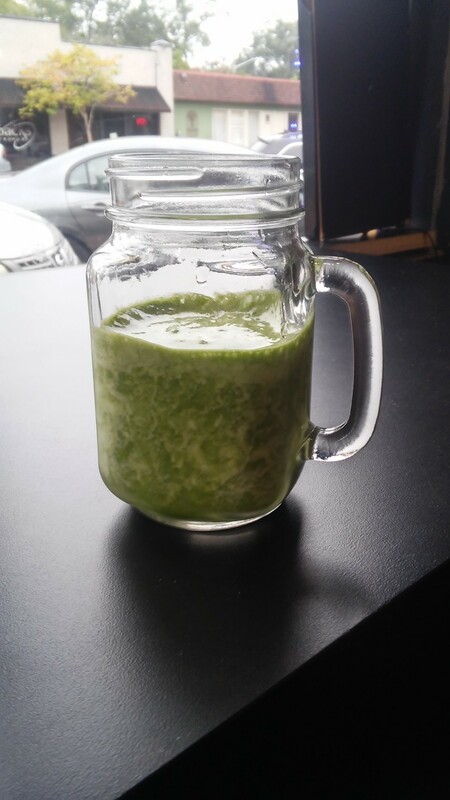 The owner offered to divide the smoothie into two glasses for us since we were sharing and they were delivered shortly later in trendy mason jars that added a nice touch. While we waited on the smoothie, we split a spinach pie ($2.79) that the owner told us was fresh baked this morning. I could absolutely taste how freshly made the spinach pie was. I’m a fanatic for spinach pie in any form and this is the best one I’ve had in Jax. The crust is flaky and just perfectly browned and is stuffed with fresh flavorful spinach, pine nuts, lemon, and olive oil. You know when you can taste the perfect “green” level in cooked veggies? This spinach had that down. It still had the fresh vibrant flavor of spinach that was amplified by the lemon. 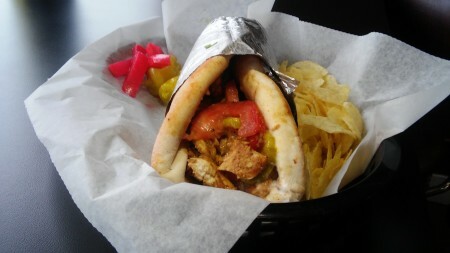 For entrees, we chose the chicken schwarma ($7.99) and the gyro ($7.99). The chicken schwarma and gyro were served in the same soft, warm pita bread and were both overly stuffed with ingredients. The chicken was tender and cut into chunks. The chicken and pita bread were covered in a pomegranate sauce that was unique and tart. It was complimented well by sweet pickles and tomatoes and served with a few slices of beets and chips. 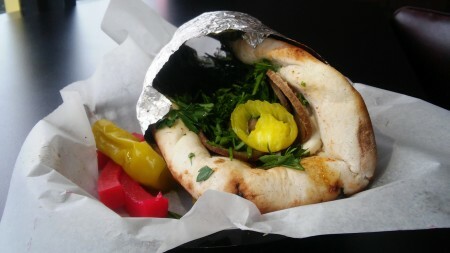 The gyro was a traditional blend of lamb and beef and covered in fresh herbs and pickled banana peppers. I hadn’t ever had banana peppers served on a gyro before and loved the salty/sour balance with the rich gyro meat. The meat was a TAD dry, but not to the point that I wouldn’t order this again. We also stole bites of our friend’s hummus and the meat pies. The hummus was extremely creamy with lots of olive oil to keep it smooth and light. The meat pies were the heavier version of the spinach pies we loved. A combination of the two for lunch would make for a filling meal paired with any of their signature smoothies. Finally, for dessert we opted for a mini baklava. They have multiple flavor varieties with different nuts, honey, and phyllo dough. We opted for the cashew variety to try. The phyllo dough was flaky and layered with honey to make it extra sweet. While I don’t think I could have distinguished the cashew flavor as cashew, it still had the token nutty flavor of baklava that is essential. It may be the mini size that diminishes the ability to figure out which nut is included. The other options were pecan and pistachio which I will definitely try in the future. We also tried a few desserts that our friends ordered including mini French macarons and a soft biscotti. The soft biscotti was like nothing we had ever tasted before. It had nearly the same dense but airy texture of fudge but still had the sweetened bread flavor of biscotti. We demolished that dessert, it was an all star. The French macarons were light and heavily filled with chocolate, mixed berry, strawberry, and a few other flavors. It should be noted, while the cookies are made on site the filling is premade. That didn’t detract from the deliciousness in our opinion. 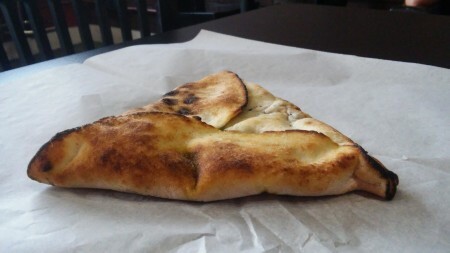 Droubi’s is an excellent addition to the King Street lineup. It’s shocking to us that Droubi’s has been open since February without much notice until recently. With their wide variety of coffees, nutritious smoothies, and delicious food with vegan, vegetarian, and carnivore options it’s sure to take off. Droubi’s, do Jacksonville a favor and put that food menu up on the wall as proudly as you display your smoothies. The fresh, made to order fare deserves the recognition. Tagged coffee and tea, Greek food, kid friendly, outdoor seating, Smoothies, vegan friendly. Bookmark the permalink.